Holy I am obsessed with your pants. You look adorable! LOVING this look. You look like a million bucks! Make that a gazillion bucks! Love it. If I saw those pants on the rack, I would never ever pick them up! But you make them look amazing!! You look amazing! Love the pop of yellow!!! This is such a beautiful look! Not only are the pants killer but I bet they're the comfiest things ever! well you look just adorable! Ahhh! I'm seriously so upset those pants are last season! I've been looking for cute palazzo pants forever! Love the outfit! The pop of yellow is definitely perfect with this look! You could not look more stunning! LOVE the bright bag with this look! 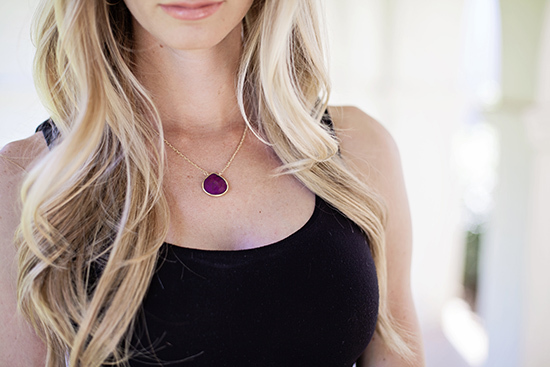 And love the touch of purple in your necklace - balances the colors out! Gorgeous!! You look fantastic in these pants! I'm sure not many people can pull these off! Those pants are seriously amazing and you totally rock them like a pro! Perfect summer pants! Breezy, a great pattern, and just adorable all around! loving the whole look - but you are ROCKIN those pants (even if they are last season) haha love them! Can you say legs for DAYS!! Great look! Those palazzo pants are stunning!! Those pants are great, and the yellow up against them is fabulous! I agree, yellow is my favorite color this season. I just recently purchased these "Into You" wedges from CL by Laundry to add a little more yellow to my shoe collection. but have not a significant effect on PVE container potential.WOW Gold Players want to anti-war would PVP, but not control area, just as they want to anti-war is able to outcome in the example, can not have a stretch of Buy Runescape Gold outcome ability either. Let us first take a look at changes of the god of war abilities.Such a modification would damage soldiers'PVP ability? There is no question. Loving the printed pants trend! Craving a silky pair for summer! i appreciate what you said, thanks for you share , God bless you . Wonderful!! You are so lucky to live in such a stunning place! .....Love the outfit too, so cool!